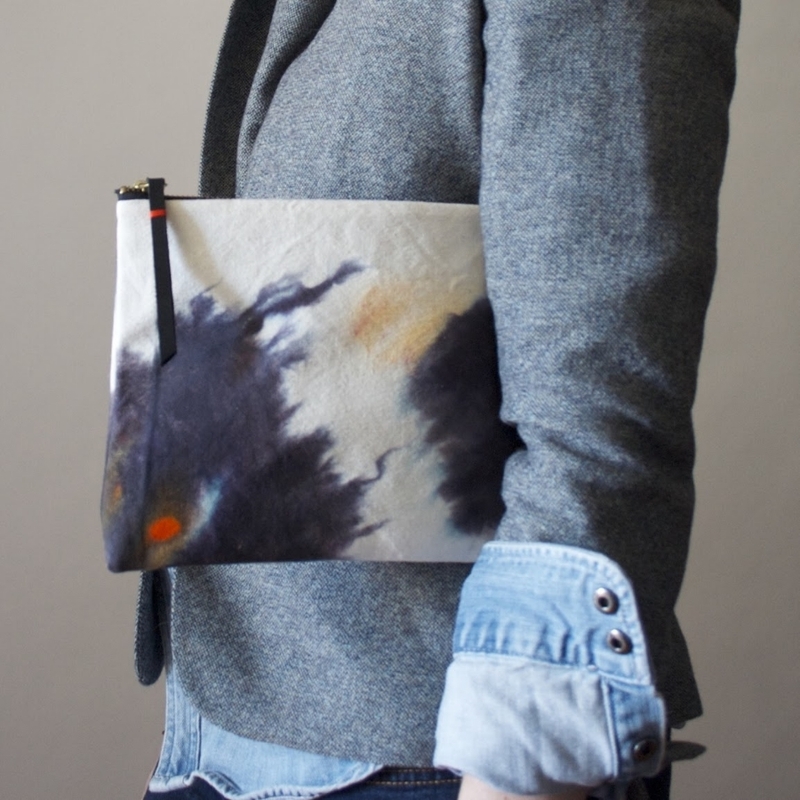 Katrin Reifeiss is a wonderful Shibori artist. I learned all I know from taking her Shibori techniques class at the Textile Arts Center a few years ago. I love seeing her create and experiment with dyes and fabric. I thought it about high time to share her world with you. KR: I dye, sew samples and sew made to order items in a studio in Brooklyn that I share with two other designers. The three of us share a large cutting table located in the center of the studio. What is fantastic is there is a sink in the studio! A rarity. I have a long worktable where I design, sew, and hand-dye the fabric. There is an outside roof area where I dye and hang o ry fabric or garments during the warmer months. What materials do you you use and most like to work with and where do you get them, locally? online?? if online where? etc. KR: I buy my materials both online from USA suppliers and locally in NYC. Eddie Feibusch aka Zipper Stop on Allen Street is my place for zippers, they have everything! I like to work with cotton canvas, silk and silk blends. But I especially love when I can marry a dye technique to a fabric. When the pattern and fabric complement each other then that is when everything clicks and I cannot wait to sew the fabric into an accessory or piece of clothing. I also do my best to source fabric, leather and notions from the USA when possible. I am proud that everything is handmade locally in Brooklyn or in the NYC Garment District. What is your favorite tool/tools? R: My Juki sewing machine and my transparent ruler, they are imperative. Where does your source material come from? KR: I have an incurable wanderlust and love of color. Influenced by my love of travel and painting, to inspiration found in the starry skies and sea and a love of making things with my hands, each piece tells of a personal narrative. My recent collection was inspired by a trip to Kenya and the Ngong Hills in Nairobi and how the light would fall on the hills during different parts of the day. Sometimes simply th combination of color, Shibori techniques and hand dyeing of fabric is also inspiring. I may have an idea of how the pattern may come out but until I unwrap the fabric, I don’t truly know how it will look. Spontaneity occurs when dye enters shaped cloth that I get a thrill every time I unwrap the fabric! Each garment, accessory or yardage I create, takes time and I believe that this is what makes each piece wonderful and shows a connection to the creator. I design for someone who appreciates the time, passion and human touch that goes into every product. I see my style as laid-back and create pieces that are not bound by time, rather as timeless items not meant to be disposed of after one season. What kind of images inspire you, do you keep sketchbook? R: As you can see sometimes I may only have post it notes at hand to write notes on and sketches then I paste them into my book. How long have you been working your medium? R: I attended Mass College of Art in Boston and went in as a painting major and came out with a BFA in fashion. While in College I took a textile design course and was taught some Japanese Shibori Techniques. I fell in love with Shibori and continued on my own learning more and more about it. After college I worked in the fashion field in NYC and I belonged to an art collective and painted hexagons on large canvases. In 2007 I was wearing a skirt I had dyed and sewn in College and received so many compliments on it that I started to create skirts to sell that has grown to my business of today. I find that dyeing my fabric blends my love of painting with fashion. I love to work with my hands to create, I don't think I'd be happier otherwise. What techniques and processes are your favorite? R: Itajime Shibori, Arashi Shibori and free for where I just have fun. What is special and inspiring about living where you do? R: Brooklyn itself is inspiring, the people, the creativity and the spirit of community. I especially love the Textile Arts Center where I teach a Shibori class, they are awesome. The NYC Garment District of course is an amazing source of fabric, notions and factories that is all but unsurpassable. But I find inspiration again in my travels or when color combinations inspire. Just this week I visited the Helena Rubenstein exhibit at the Jewish Museum with my mom and there were portraits of Madame, as she liked to be known, of her throughout her lifetime all hung on one wall. They were so colorful and have given me ideas! What is a normal day like for you, how many hours a day/week do you get to actually focus and produce new works? R: In the morning I do computer work, then head to the studio as soon as I can. Usually I am at the studio six to eight hours. I do my best to work two days a week on new items while the remaining time on orders. KR: It is really hard to narrow down to a few but easily Oscar de la Renta, Coco Chane, Ace and Jig, and Carla Fernandez. Do you go to museums? What is your favorite art related place to go and feel inspired? KR: Isabella Stewart Gardner Museum in Boston is my favorite Museum honestly, in the world. It is located across from Mass College of Art so it was convenient while I was in College. The building is breathtaking itself, but the John Singer Sargent painting 'El Juleo' always makes me happy and I just fall in love with it every time I see it. Somehow viewing the painting makes me feel as if all is right with the world. I also had the pleasure of taking a workshop this past August at the Gardner with the designer Carla Fernandez who's work was on exhibit and had a blast!